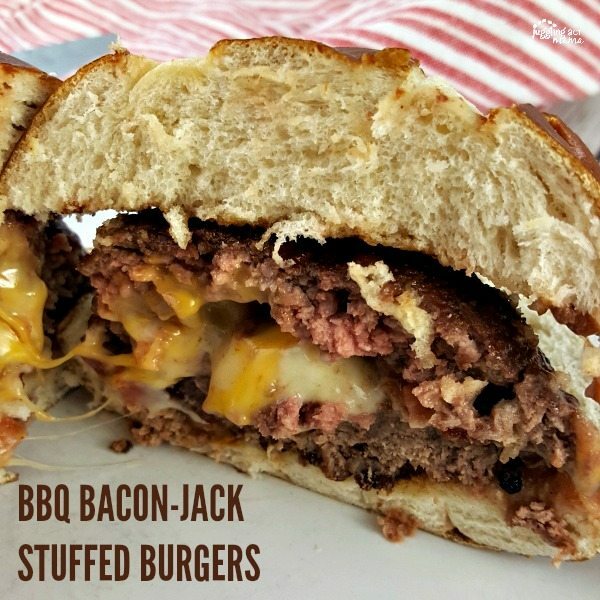 BBQ Bacon-Jack Stuffed Burgers are an all-time favorite for cheese-lovers! Nothing says summer quite like a burger cooked on the grill! 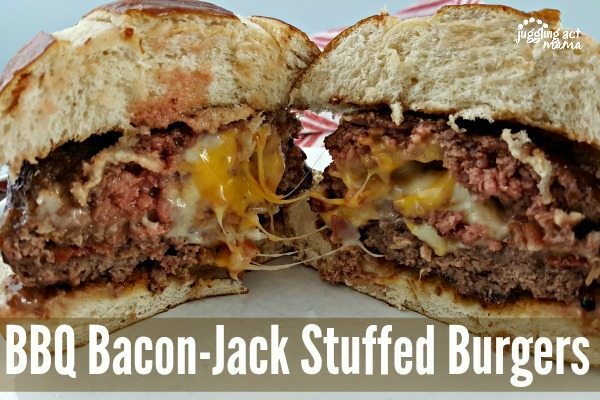 My favorite burger is one loaded with cheese, so I’m sharing my recipe for BBQ Bacon-Jack Stuffed Burgers. I’m a cheese kind of girl and love having lots of varieties in my fridge for snacking and cooking. I love Heluva Good! cheeses because they are made with real milk. It’s a good source of protein and an excellent source of calcium, too. Plus, there are 0 grams of trans fat per serving. You can find Heluva Good! Cheese in the dairy aisle of your neighborhood supermarket. I love grabbing all the ingredients I need for a backyard cookout at Walmart. It’s just so convenient to make one stop. So, when you are ready to go, here’s what you’ll need. What Kind of Cheese is Best To Stuff In A Burger? There are so many amazing flavors of cheese, each of them with a different level of creaminess, melting point, and sharp bite. 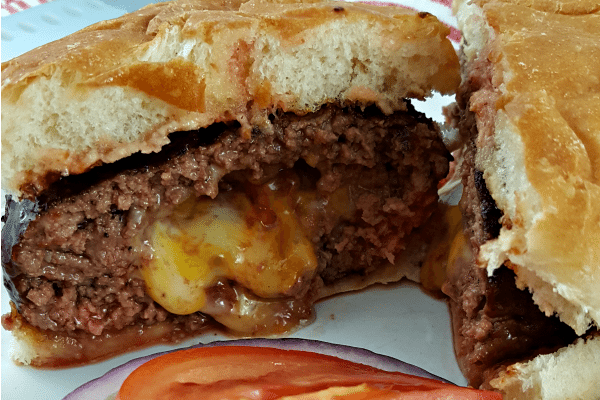 Colby-Jack or Jalapeno Jack cheese is our favorite to put in the burger because it melts so nicely and the flavor (especially from the Jalapeno Jack) adds a pop of heat. You could also choose an extra sharp cheddar for a little more bite. 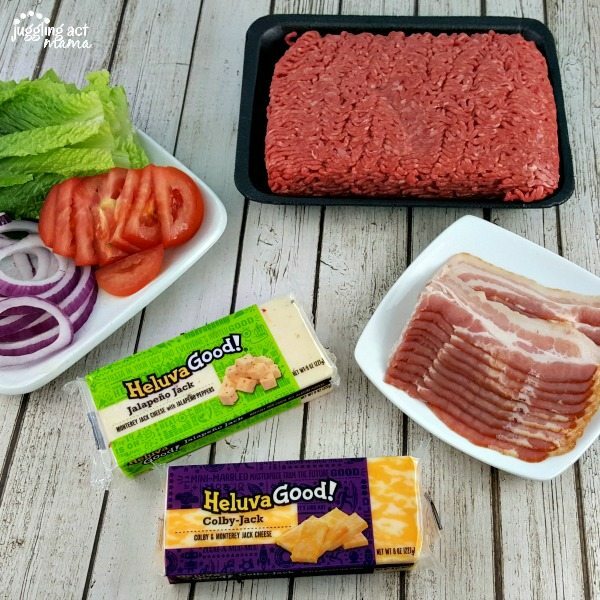 You can make these burgers with Heluva Good Colby-Jack, or you can kick them up a notch with the Jalapeno Jack cheese – which is how Mr. Jugging Act likes his. Seriously, I couldn’t stop taking photos of these luscious burgers… well, that and nibbling on cubes of cheese and pieces of bacon! Something I noticed while making these burgers is that it was way too easy to run out of the ingredients because we all snacked on them too! Here’s my “pro” tip – make extra bacon for snacking, and cut up extra cheese for those sneaky kids that will steal them while you’re preparing the burgers. 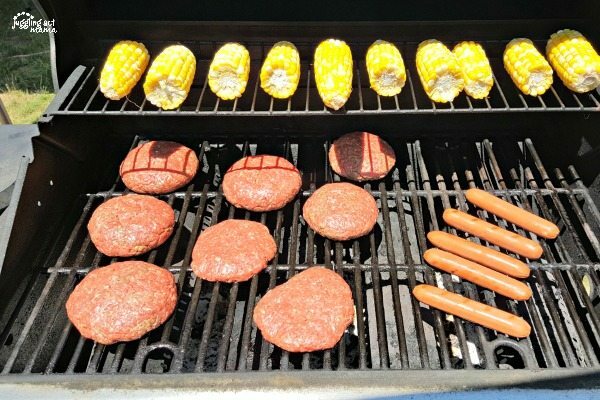 If you prepare extra for snacks and set them out away from the grill, you’ll have plenty for the burgers too. Fire up the grill! 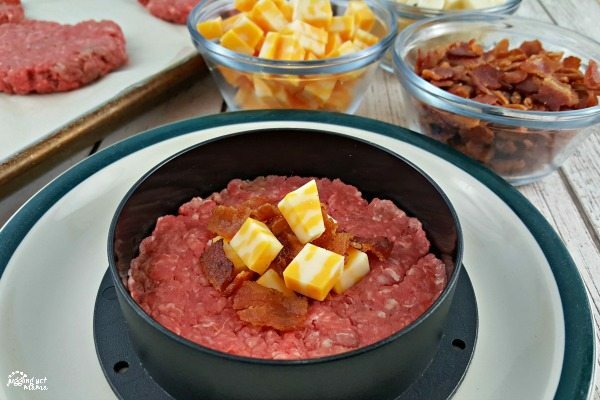 These cheese-stuffed burgers are going to be your family’s new favorite meal! Divide the ground beef into eight portions (each will be about 3 ounces). I used a burger press to get evenly shaped patties. Add a quarter of the crumbled bacon, and a quarter of the cheese, then top with a second patty. Pinch the edges to seal the patty shut. Repeat until you have 4 burgers ready for the grill. Season each patty with salt and pepper on both sides. When your grill has reached high heat, brush the grates with a little canola oil. Add the patties and cook for 3-4 minutes per side for medium burgers. 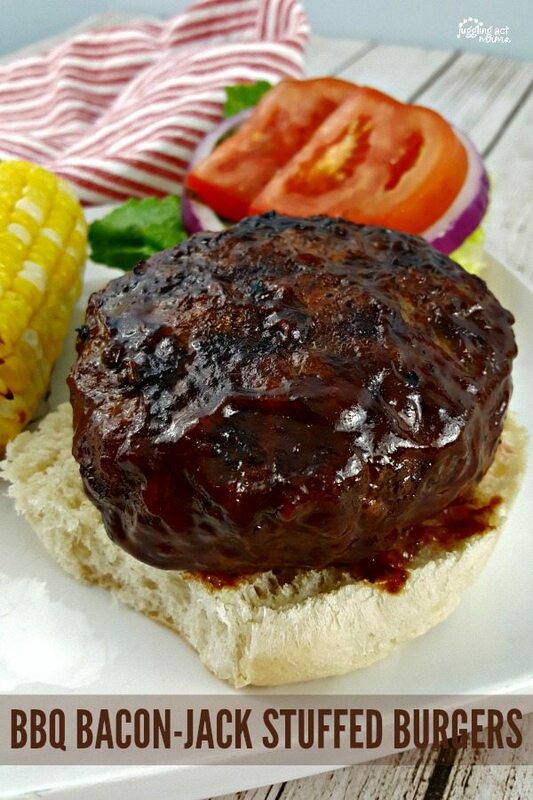 Brush each side of the burger with your favorite BBQ sauce just before removing from the grill. If you wish, you can slice additional Heluva Good Colby Jack or Jalapeno Jack Cheese to put on top of the burger. Serve on your roll with lettuce, tomato and onion slices, and other condiments, if desired. How Do You Stuff Burgers With Cheese & Bacon? I couldn’t do this as easily or as well without my burger press. As you can see in the picture below, it is super easy to place the meat in the press, then fill it with the cheese and bacon, and then top with more meat. These are priced affordably and really take your grilled burgers to a fun to level! The cooking time for burgers depends on the heat of the grill, how thick the burger is, and how “done” you like your burger. There are a few ways to tell if a burger is done. The worst way is to cut it open and see how pink it is. This is reliable but ruins the beauty of the burger. Most burgers will cook on the grill in about 4-5 minutes per side. You can always check the temperature of the meat. When it reaches 160 degrees, it is fully cooked. My favorite way to tell if it is cooked is by feeling the burger. A rare burger will feel as soft as a fully relaxed, open palm. A medium or medium-rare burger will be a bit firmer, feeling like your palm when the thumb and middle finger touch. A well-done burger is as firm as a fully flexed palm or when the thumb and pinky fingers are touching. 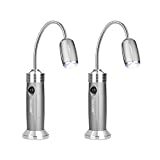 Amazon Disclosure: This post contains Amazon Affiliate links. All opinions are my own, but I only promote things that I love and think you will love, too! This does not increase the cost to you but does help support Juggling Act Mama. For more information, please see our Disclosure Policy. 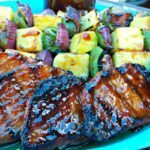 If you enjoy grilling, here are some recipes you seriously have to try. 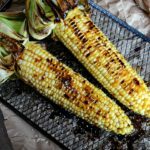 Balsamic Grilled Vegetables with Goat Cheese – Neighbor Food Blog – The balsamic vinegar is perfect for the veggies, and the goat cheese crumbles add flavor and texture, making this a popular side dish for cookouts. Grilled Vegetable Flatbread Pizza – Craving Something Healthy – Since these are cut into strips, they are super easy to eat without utensils. They are delicious and great for picnics. Grilled Steak With Bourbon Garlic Butter – West Via Midwest – You won’t believe how amazing this Bourbon Garlic Butter is! 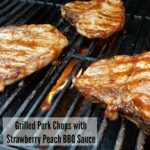 Her tutorial is easy to follow and you’ll have enough butter to use on rolls, pork chops, and veggies. My family loves eating a lot of burgers during the summer. I haven’t done a stuffed burger in a long time and I think they would love this. Thanks for sharing it on Merry Monday. Pinned. These burgers look amazing! Pinning. I am not a cook but I will be giving this one to my hubby to make for dinner. They look so yummy. We’re big burger fans so I’m definitely going to try out this recipe! This is my new go-to burger recipe – I’m so in love with all the cheesy bacon goodness!